... You've got to ask yourself one question: Do I feel lucky? Well, do ya, punk? After the success of The Floating Admiral, The Detection Club soon decided to do another round-robin novel entitled Ask a Policeman. The cast list was once again comprised of all-stars, but this time they were not quite as numerous. 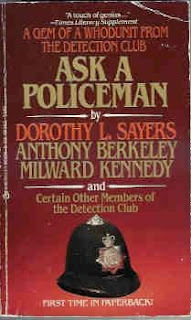 Six novelists combined their efforts into Ask a Policeman, namely Helen Simpson, Milward Kennedy, John Rhode, Anthony Berkeley, Gladys Mitchell, and Dorothy L. Sayers. The plot is only a semi-serious one, although the parody elements never outweigh the detection elements. A rich, despised-by-all newspaper tycoon is shot dead at his house, with a plethora of suspects playing a complex game of ring-around-the-rosy around the scene of the crime. But, as luck would have it, these suspects happen to include an Archbishop, the Chief Whip of a political party, and an Assistant Commissioner of Scotland Yard. But for good measure, you can throw in the dead man’s secretary and a Mysterious Lady, as well as a suspicious butler and other members of the domestic staff. The problem is outlined by John Rhode, and thus begins a delightful romp. Four detective novelists – Helen Simpson, Gladys Mitchell, Anthony Berkeley, and Dorothy L. Sayers – exchange sleuths. And so we get a look at Mrs. Bradley as portrayed by Helen Simpson. Lord Peter Wimsey is brought to the crime scene with a flourish by Anthony Berkeley. And so on. This gimmick permits the authors to poke fun at detective story conventions and the eccentricities of each other’s’ sleuths. The best chapter of the lot is Anthony Berkeley’s, in which he brings Lord Peter Wimsey onto the scene. This is a wickedly funny and merciless parody of Lord Peter, who at one point consults with his butler on what clothes one should wear when calling on a potentially homicidal archbishop. Then there’s that terrific moment with his mother, where she muses on how bad it would be to hang an archbishop… And Lord Peter himself in a footnote declares surprise that he referred to the clergyman by the diminutive “Archbish”! The best part of the chapter, however, is that Berkeley manages to provide a clever solution to the problem all while maintaining this very funny layer of satire. Dorothy L. Sayers replies as best as she can with Roger Sheringham, and although it’s not quite as funny as Berkeley’s chapter, she does get one or two good digs in there, such as when Sheringham overhears two servants being extremely rude about his investigation behind his back. And I really liked how Sayers portrays Sheringham as a hit-or-miss detective in keeping with Berkeley’s stories. All this is tied together by Milward Kennedy… and although he does point out a major flaw in Lord Peter Wimsey’s clever theory, the alternative he proposes is nowhere near as clever. Indeed, he acknowledges as much and admits to readers that he’s about to pull off a colossal cheat. But just because you say it with a tongue-in-cheek tone, it doesn’t make the cheat any more palatable. It’s a regrettably lackluster conclusion to what was an excellent story, although Kennedy does a good job of resolving discrepancies between the four detectives’ stories (such as the secretary’s habit of popping in and out of jail as the plot requires). The four sleuths managed to play fair and come up with an excellent solution, so you can always just ignore Milward Kennedy’s solution as a harmless bit of rambling. 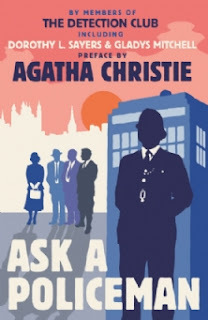 Ask a Policeman is well-worth reading for fans of the genre, and thankfully, HarperCollins has reissued it in both print form and on the Kindle. I bought a Kindle edition for this review, and although I enjoyed the book itself tremendously, I have major issues with HarperCollins’ edition. 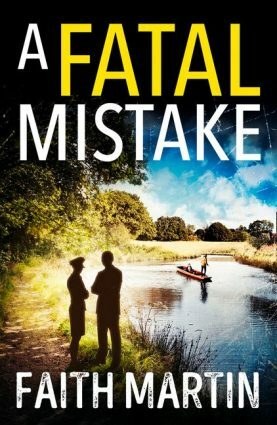 The Kindle version has major editing mistakes, and I hate pointing these out because I always have a few typos slipping by me in these blog posts, so I sound like a hypocrite. But when your department can’t even catch the fact that the calibre of the bullet, .22, is consistently being printed as ?22, someone is not doing his or her job!!! That isn’t the only recurring typo, and indeed, it often feels like someone used mediocre OCR software and didn’t bother to proofread every page. Mistakes tend to show up in bunches and they can get rather distracting. But I have an even bigger issue with this new edition. The authors of this book were Simpson, Rhode, Kennedy, Sayers, Berkeley, and Mitchell. So why does Agatha Christie get top billing??? I’m not even joking, although I wish I was: the publisher has simply dug up an old essay and claim that this is the first time it’s ever been published (although it was previously published in an issue of CADS). This essay takes up about 4% of the Kindle book—I’m being generous with my rounding, though. Christie didn’t contribute a single word to this novel—her name just sells, and in a cynical attempt to get more money out of fans, HarperCollins has emblazoned her name onto this book despite the fact that she contributes 4% of the total content! And this is the other problem I have: the name Agatha Christie has in itself become a cash cow, and her estate doesn’t seem to mind at all. Her name has become a guaranteed way to get subpar TV scripts produced by hastily changing a few names and writing in Miss Marple. How else to explain The Secret of Chimneys? Or Murder is Easy? Or Why Didn’t They Ask Evans? And the infuriating thing is that the producers know that fans of Christie will shell out their money because of their love for her work! But to do this trick with Christie’s name to Ask a Policeman, in the same way as it is done to the average episode of Marple? That’s not just a slap in the face of fans, it’s an insult to the authors themselves. And although Christie’s essay is genuinely interesting, I can’t help but feel that someone who pays $12.67 for a Kindle edition of the book, solely to read this never-before-published-except-that-one-time essay is going to feel cheated. Not only is it such a small part of the book, the rest of the book is so hastily and sloppily put together that you are always aware of the fact that this book was only published because Christie’s name was attached. HarperCollins has put me in a fun situation. 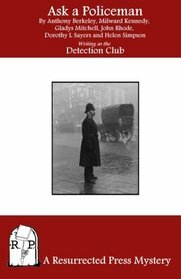 If I recommend not buying this book, we might never again see more of these Detection Club volumes published. If I recommend buying the book, on the other hand, it will open the door to similar cynical, hastily-scrapped-together volumes. Maybe the print edition has better editing than the Kindle edition, but I only own the Kindle edition. 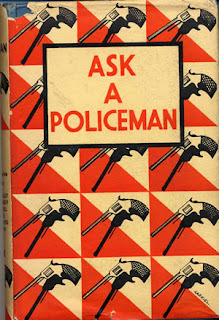 Ask a Policeman is well-worth reading and I highly recommend it, but you decide for yourself whether to buy this new edition or to find a used copy somewhere on the Internet. I really want to read this, but I hate badly edited books. However, I've found that Kindle editions often have errors not in print books. Unfortunately, most people wouldn't even consider reading this book without Christie's name on it. As a marketer, I wonder if the Christie estate has given much consideration to the damage they might be doing to the Christie brand name. Marketers of course are always tempted to stick a hot-selling brand name on related products, but the wise ones know that the related product had better be good, or they might damage the original brand. Interesting review, Patrick. Sounds like one should avoid the Kindle version! Surprising a megalith like HarperCollins would be so sloppy (or, sigh, maybe it's not). Anthony Berkeley was a great satirist. "As an avid Agatha Christie fan, I am always looking for one more of her works. The introduction to the book by Agatha herself is worth the price." She doesn't even mention the actual bulk of the book, the 96% you mention. It's a shame CADS doesn't have a publicity department, just think how many issues they could have sold when they originally published Christie's essay a few years ago! CADS is a great magazine, but no one outside of the most knowledgeable Golden Age connoisseurs knows about it.